I'm very concerned that as the warmth migrates north over the next serveral weeks, so will the large severe weather outbreaks. 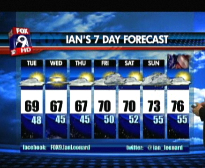 I expect June to be one of the most active months ever here in MN. 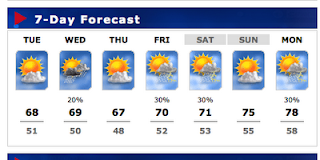 That's assuming the warm actually migrates here and we have a semblance of a summer. To my uninformed eyes, the atmosphere just seems to want to "default" to something that's not very summerlike. I agree with Bill. :) I'm going with the Farmer's Almanac prediction for this summer - cooler than average temps for most of the summer and a few (not many) periods of hot temps. Remember, hot air doesn't necessarily mean severe weather. Often, the really hot stuff contains a capped environment that actually hinders storm development. I'm concerned most about the battle of air masses. This set-up has been really strong this Spring and it only makes sense that this battle ground boundary will migrate north. The size and strength of the synoptic storms have been impressive, especially over the last month. I simply don't see any evidence of this changing anytime soon. Sunday was a cool, humid, rainy day and suddenly a 10 mile stretch of the west metro is cleaning up after a significant tornado touchdown. The fight between air masses is causing a cataclysmic twist to a lot of storm systems that we don't usually see. I, too, had wondered if the mess would make it north with our non-spring/summer, but after Sunday, it's clear to me that, this year at least, we don't need the heat to feel the wrath. Well Anonymous...you'll get your chance. 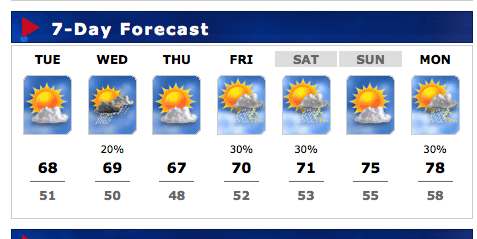 Sounds like all meteorologists in town are calling for sun tomorrow. Well... I really hope that things dont get bad. I do belive La Nina is to blame for a good part of it; I have never seen it linger for so long before. It seems to be causing colder than average tempatures in the north and warmer than average tempatures in the south. Most of the severe weather outbreaks apperar to be in the area marked EC- Equal Chances of above or below avereage tempatures-from the NWS Climathe Prediction center. Agree with @NovakWeather about the migration of the severe weather pattern in June to the Upper Midwest. For one that is a climatological norm as June is THE tornado month for Minnesota. And, two given the pattern that looks to continue the intensity of storms will likely continue. Having seen the power of it all first hand in Georgia, Alabama, Arkansas and Oklahoma its all pretty incredible and a bit scary to what this year's severe weather season has wrought upon the nation. I type this as I look at the massive line of thunderstorms with tornado or severe thunderstorm warnings from northeast Ohio to central Indiana and southward to west-central Tennessee into central Mississippi -- all headed east to us in Georgia. Lovely. I for one love this cooler weather,60's are awesome,70's are okay as well,with only one 80 degree reading thus far(second one could be Memorial day),who the hell likes dew points above 60 with hot weather,I'll take this everyday of the spring/summer,its better then walking out your front door and breaking a sweat.I believe tommorrow will be a struggle to crack 60,may stay in the 50's all day and if you listen to the NWS rain is possible for parts of everyday from Fri till Tuesday. I sure hope we have a summer like we did in 2009. I LOVED that summer, not all hot and sticky. I only turned on the A/C a couple times that year. Memorial Day looking more and more interesting with each successive model run. This could easily turn into our opportunity for a significant severe wx outbreak. Should be a good conversation topic over the weekend. So, what is the exact setup of the situation? Not a fan of Dahl showing a graphic of a slight and moderate risk over Minnesota. It implies something from the SPC which its not. I would try and answer your question if I was meteorologist but I'm just a amateur weather geek. 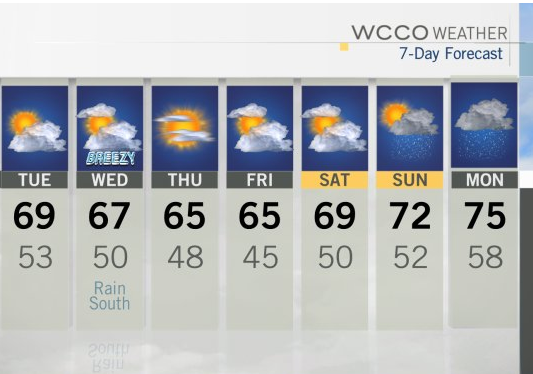 I can however direct you to NWS home page for both Minneapolis and Lacrosse where you can read the forecast discussion, the link is on the left side of their home pages. Keep in mind the that the models show the warm front passing north of the Metro by 1pm or so but if the warm front slows down and doesn't come through till late afternoon...that could change everything. Here are my grades for the various outlets that most of us look to when severe weather is forecast, based on their weather home page web sites and how much info they give us, in particular do they show the Storm Prediction Center risk area? and if they do, do they explain the meaning of it? Star Tribune gets a C because they showed the risk area but did not adequately explain it. An explanation of what it means would have resulted in a A. Come people take the gloves off and treat us like we have some intelligence. Severe weather should be like hurricanes. Just use the NHC or SPC forecast. They're the best for a reason. Especially FOX9, with that newly hired weather-woman that even when it was clear the 'squall-line' was falling apart as it moved east, continued to hype it. Kudos to the NWS that in their discussion were the only one to use the word IF. 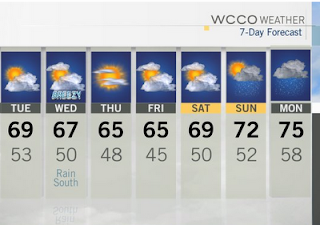 "If the storms make it to MSP....."
Another example of why a 7-day forecast is such a questionable pursuit. Nobody came within 10 degrees of yesterday's 88. @Rigil Weather.com had a 50% chance of the storms holding together, which is less than what the NWS had and what was indeed suggested by most of the local weathercasters. 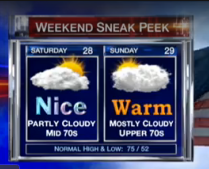 That is Why I like the NWS the most. Thay are very careful NOT to make guarantees, unless they are absolutly certain. They use the word IF. The local stations use the word WHEN.